This small, mobile cube was recently recognized by the AIA as part of their small projects awards. Designed by Spaceflavor, the small volume houses three of the clients everyday activities while rolling around in his larger apartment. 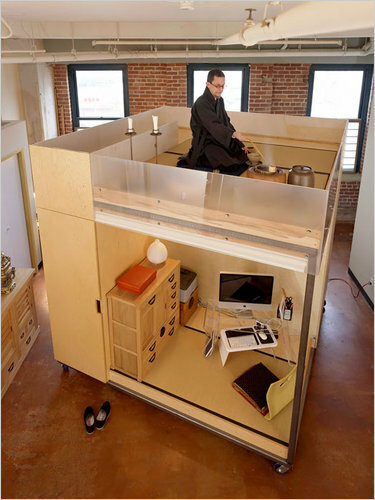 The CUBE’s client teaches feng shui classes in his apartment, and what the CUBE allows him to do is roll away his private spaces while his apartment is full of students, opening more floor area for classes. Admittedly, I know nothing about feng shui, but I do know how nice it would be to have this kind of flexibility in a living space. If the client ever decides to move, the cube can be taken apart in pieces that fit through a standard door.